Objectives: We sought to identify the risk factors associated with the early mortality after a living-donor liver transplant. Materials and Methods: Two hundred eighteen patients were recruited in this study. Potential risk factors were analyzed using univariate and multivariate analyses. A C statistic equivalent to the area under the receiver operating characteristic curve was used to assess the ability of the model to predict mortality risk during the first 3 months after a living-donor liver transplant. Results: Twenty-six recipients died within the first 3 months after a living-donor liver transplant. On a multivariate analysis, intraoperative allogeneic red blood cell transfusion and the preoperative creatinine levels were independently associated with early postoperative mortality. A prognostic model was proposed in this study (early mortality risk score = 0.107 × intraoperative allogeneic red blood cells transfusion [U] + 0.005 × preoperative creatinine concentration [μmol/L]). Three-month survival rates of patients with high and low scores were 69.8% and 95.5% (P < .001). Conclusions: Transfusion of intraoperative allogeneic red blood cell and preoperative creatinine levels are associated with the early mortality after living-donor liver transplant. A model to predict early mortality after a living-donor liver transplant based on these risk factors was proposed in this study. Liver transplant is widely accepted as the curative treatment for patients with end-stage liver disease. However, worldwide scarcity of deceased-donor liver grafts limits its management. Living-donor liver transplant is a useful alternative to deceased-donor liver transplant, and has saved many lives in past 20 years. As a complex surgical procedure, many factors may negatively influence the outcomes of patients undergoing living-donor liver transplant, especially during the early postoperative period.1 Previous investigations suggested the early mortality after liver transplant was about 5% to 10%.2 However, which factors contribute to early death after liver transplant has not been well established. Although previous investigations suggest the severity of liver disease assessed by Model for End-Stage Liver Disease score is useful to predict early mortality after liver transplant, it remains controversial.3-6 Here, we attempt to identify risk factors associated with early mortality after a living-donor liver transplant. All adult patients who underwent a living-donor liver transplant at our center between 2005 and 2012 were recruited into the present study. Patients receiving a dual graft living-donor liver transplant, repeat transplant, or a combined liver and kidney transplant were excluded. All transplants and the current study were approved by the ethics committee of West China Hospital, Sichuan University. All of the protocols conformed with the ethical guidelines of the 1975 Helsinki Declaration. Written informed consent was obtained from all subjects. Liver donors were healthy relatives within the third degree of consanguinity with a compatible ABO blood type. Serologic testing for viral hepatitis and human immunodeficiency virus antibodies and testing for other acute or chronic diseases had to prove negative. We used a volumetric computed tomography with contrast to evaluate the donor’s liver. The right hepatic lobe without the middle hepatic vein of the donor’s liver had to be at least 0.8% of the weight of the recipient’s, and the remnant liver had to be at least 40% for the donors. A detailed surgical procedure has been described previously.7 Briefly, after induction of general anaesthesia, surgery for donors was done through a right subcostal incision with an extension to the upper midline. After abdominal exploration, a liver biopsy was performed to assess the amount of steatosis present. After the cholecystectomy, an intraoperative cholangiogram under fluoroscopy via the cystic duct was done to evaluate the biliary anatomy. Liver transection was performed using a Cavitron ultrasonic surgical aspirator (Valleylab [a division of Tyco Healthcare Group LP], Boulder CO, USA) without inflow occlusion. At the end of the liver parenchymal transection, the right bile duct, hepatic artery, and portal vein were divided. All hepatic veins larger than 0.5 cm were preserved until recovery for potential anastomosis in the recipient. The falciform ligament was reconstructed, and the stumps of the hepatic vein and portal vein were closed with continuous nonabsorbable sutures. Before closure, a drain was inserted into the right subphrenic cavity. All grafts were preserved and flushed with University of Wisconsin solution. Reconstruction of the hepatic artery was done after reperfusion. A jump graft to the aorta was done using the recipient’s saphenous vein if recipient’s hepatic artery was inadequate. A duct-to-duct anastomosis was the first choice for bile duct reconstruction. A bile duct stent was not used in any patients. If the recipient’s bile duct was inadequate, a Roux-en-Y hepaticojejunostomy was performed. A veno-venous bypass was not used in any recipients. Postoperative immunosuppression consisted of a calcineurin inhibitor (tacrolimus or cyclosporine), mycophenolate mofetil, and a steroid. Tacrolimus was usually initiated within the first 24 hours after surgery. For patients with severe renal dysfunction, the calcineurin inhibitor was replaced with sirolimus. Calcineurin inhibitors were administrated to these recipients when their renal function had stabilized. Steroids were withdrawn as soon as possible. Rejection was treated with steroid pulse therapy. Lamivudine and hepatitis B immune globulin were used after the liver transplant to prevent recurrence of hepatitis B virus in patients with positive pretransplant HBsAg. Hepatitis B immune globulin was used during transplant for hepatitis B virus patients. Survival of the recipient was estimated using the life-table method and compared using the Kaplan-Meier method with the log-rank test. Continuous variables were presented as means ± SD and compared using a 1-way analysis of variance, whereas categorical variables were analyzed using the chi-square test or Fisher exact test. The Cox regression analysis was used to identify the variables that were independently associated with early postoperative mortality. Significant variables, those with a P value less than 0.1 in the univariate analyses, were subsequently included in the multivariate analysis. To identify the individual risk of early postoperative mortality in a given patient, an equation was developed that identified independent risk factors: F(x) =β1x1 + β2x2 +…+ βixi, where xi is the identified independent risk factor, and βi is the regression coefficient. Sensitivity and specificity were estimated using the receiver operating characteristic curve. Statistical analyses were performed with SPSS software (SPSS: An IBM Company, version 16.0, IBM Corporation, Armonk, NY, USA). P values less than .05 were considered statistically significant. Two hundred eighteen recipients were included in the current study. 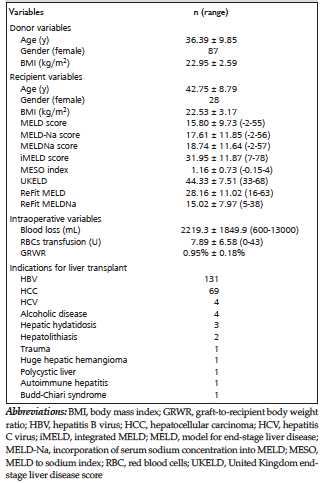 As shown in Table 1, the indications for liver transplant included hepatitis B virus cirrhosis (n = 131), hepatocellular carcinoma (n =69), alcoholic cirrhosis (n = 4), hepatitis C virus cirrhosis (n = 4), hepatic hydatidosis (n = 3), hepatolithiasis (n = 2), trauma (n = 1), huge hepatic hemangioma (n = 1), polycystic liver (n = 1), autoimmune hepatitis (n = 1), and Budd-Chiari syndrome (n = 1). The mean age of the recipients was 42.75 ± 8.79 years, whereas the mean age of the donors was 36.39 ± 9.85 years. The original Model for End-Stage Liver Disease scores ranged from less than 6 to more than 40, with a mean of 15.80 ± 9.73. The mean graft-to-recipient body weight ratio was 0.95% ± 0.18%. During the follow-up, 26 recipients (11.93%) died. The causes of death were multiple organ dysfunction syndrome (n = 14), infection (n = 7), renal failure (n = 3), and bleeding (n = 2). The overall 3-month survival rate was 88.1%. Risk factors possibly associated with 3-month mortality after a living-donor liver transplant were investigated in the univariate analysis. 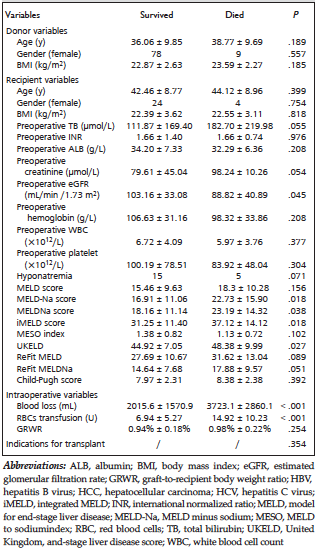 As shown in Table 2, significant factors predicting mortality in the first 3 months after a living-donor liver transplant were preoperative total bilirubin level, preoperative hyponatremia, preoperative creatinine level, intraoperative blood loss, intraoperative red blood cells transfusion, and preoperative estimated glomerular filtration rate. These potential risk factors were entered into a multivariate analysis to determine their independent significance. On multivariate analysis, only preoperative creatinine and intraoperative red blood cell transfusion were identified as independent predictors of a poor prognosis (Table 3). After multivariate analysis, the regression coefficients listed in Table 3, and the risk factors independently associated with the 3-month mortality after a living-donor liver transplant, were used to generate the following formula: Early mortality risk = 0.107 × intraoperative allogeneic red blood cells transfusion (U) + 0.005 × preoperative creatinine concentration (μmol/L). 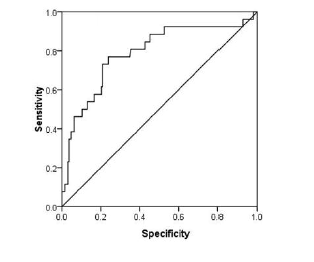 The receiver operating characteristic curve determined that the best cutoffs for early mortality were values greater than 1.3, with a sensitivity of 76.9%, and a specificity of 75.5% (Figure 1). As shown in Figure 2, the 3-month survival rates for patients in the current study with high (risk score > 1.3) and low (risk score ≤ 1.3) early mortality scores were 69.8% and 95.5%. A statistically significant difference was observed (P < .001). Living-donor liver transplant is a complex surgical procedure. Many factors negatively influence the outcomes of patients undergoing a living-donor liver transplant, especially during the early postoperative period. Our study confirmed that the preoperative creatinine concentrations and intraoperative red blood cell transfusions were independent risk factors for the first 3-month mortality after a living-donor liver transplant. Several investigations have reported that massive intraoperative allogeneic red blood cell transfusions have a negative effect on liver transplant recipient outcomes.19-21 Ramos and associates22 confirmed that massive red blood cell transfusions are associated with longer hospital stays, and decreased postoperative survival for liver transplant recipients. Benson and associates23 suggest that red blood cells transfusion contributes to postoperative infections in a dose-dependent manner. Hendriks and associates24 report that the requirement for intraoperative blood products is a risk factor for postoperative reintervention after a liver transplant. Intraoperative red blood cell transfusion is an independent risk factor for early postoperative mortality after a liver transplant in the present study. This result suggests that postoperative outcomes of liver transplant depend partly on the intraoperative management. Model for End-Stage Liver Disease scores showed poor predictive power for early postoperative mortality after a living-donor liver transplant in the present study. However, some investigations suggest that a high preoperative Model for End-Stage Liver Disease score is associated with poor postoperative outcomes.25,26 Previous studies confirm the biochemical variables of recipients who recovered rapidly after living-donor liver transplant and have shown these returned to similar levels during the first postoperative month among groups with different Model for End-Stage Liver Disease scores.27 Jacob and associates28 suggested that some unpredictable variables during the transplant, in addition to the severity of disease at the time of transplant, may negative influence the postoperative outcomes after liver transplant. Our results suggest that intraoperative red blood cells transfusion is associated with the early postoperative mortality. However, Model for End-Stage Liver Disease score and Model for End-Stage Liver Disease-based models all are based on the preoperative variables and include no intraoperative variables. Accordingly, Model for End-Stage Liver Disease scores and Model for End-Stage Liver Disease-based models did not show predictive power in the present study. Intraoperative allogeneic red blood cells transfusion and the preoperative creatinine level are independent risk factors for early postoperative mortality. A model based on intraoperative allogeneic red blood cells transfusion and preoperative creatinine level, which was proposed in the present study, shows good prognostic power for predicting early postoperative mortality after a living-donor liver transplant. Doyle HR, Marino IR, Jabbour N, et al. Early death or retransplantation in adults after orthotopic liver transplantation. Can outcome be predicted? Transplantation. 1994;57(7):1028-1036. Moreno R, Berenguer M. Post-liver transplantation medical complications. Ann Hepatol. 2006;5(2):77-85. Santori G, Andorno E, Antonucci A, et al. 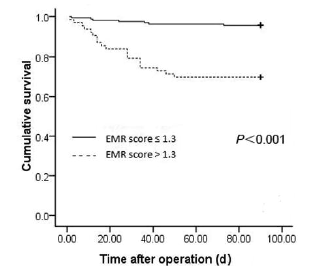 Potential predictive value of the MELD score for short-term mortality after liver transplantation. Transplant Proc. 2004;36(3):533-534. Vrochides D, Hassanain M, Barkun J, et al. Association of preoperative parameters with postoperative mortality and long-term survival after liver transplantation. Can J Surg. 2011;54(2):101-106. Dawwas MF, Lewsey JD, Watson CJ, Gimson AE; UK, Ireland Liver Transplant Audit. The impact of serum potassium concentration on mortality after liver transplantation: a cohort multicenter study. Transplantation. 2009;88(3):402-410..
Nagler E, Van Vlierberghe H, Colle I, Troisi R, de Hemptinne B. Impact of MELD on short-term and long-term outcome following liver transplantation: a European perspective. Eur J Gastroenterol Hepatol. 2005;17(8):849-856. Li C, Mi K, Wen Tf, et al. Outcomes of patients with benign liver diseases undergoing living donor versus deceased-donor liver transplantation. PLoS One. 2011;6(11):e27366. doi: 10.1371/journal.pone.0027366. Malinchoc M, Kamath PS, Gordon FD, Peine CJ, Rank J, ter Borg PC. A model to predict poor survival in patients undergoing transjugular intrahepatic portosystemic shunts. Hepatology. 2000;31(4):864-871.
de Boer MT, Christensen MC, Asmussen M, et al. The impact of intraoperative transfusion of platelets and red blood cells on survival after liver transplantation. Anesth Analg. 2008;106(1):32-44, table of contents. Porrett PM, Hsu J, Shaked A. Late surgical complications following liver transplantation. Liver Transpl. 2009;15(suppl 2):S12-S18. Delanaye P, Mariat C. The applicability of eGFR equations to different populations. Nat Rev Nephrol. 2013;9(9):513-522. Park I, Moon E, Hwang JA, et al. Does hepatorenal syndrome affect the result of liver transplantation? Clinical observations. Transplant Proc. 2010;42(7):2563-2566. Kundakci A, Pirat A, Komurcu O, et al. Rifle criteria for acute kidney dysfunction following liver transplantation: incidence and risk factors. Transplant Proc. 2010;42(10):4171-4174. Northup PG, Argo CK, Bakhru MR, Schmitt TM, Berg CL, Rosner MH. Pretransplant predictors of recovery of renal function after liver transplantation. Liver Transpl. 2010;16(4):440-446. Dellon ES, Galanko JA, Medapalli RK, Russo MW. Impact of dialysis and older age on survival after liver transplantation. Am J Transplant. 2006 ;6(9):2183-2190. Ijtsma AJ, van der Hilst CS, de Boer MT, et al. The clinical relevance of the anhepatic phase during liver transplantation. Liver Transpl. 2009;15(9):1050-1055. Barri YM, Sanchez EQ, Jennings LW, et al. Acute kidney injury following liver transplantation: definition and outcome. Liver Transpl. 2009;15(5):475-483. Dunn LK, Thiele RH, Ma JZ, Sawyer RG, Nemergut EC. Duration of red blood cell storage and outcomes following orthotopic liver transplantation. Liver Transpl. 2012;18(4):475-481. Wiederkehr JC, Igreja MR, Nogara MS, et al. Analysis of survival after primary liver transplantation: multivariate analysis of 155 cases in a single center. Transplant Proc. 2010;42(2):511-512. Rahbari NN, Garden OJ, Padbury R, et al. Posthepatectomy liver failure: a definition and grading by the International Study Group of Liver Surgery (ISGLS). Surgery. 2011;149(5):713-724. Ramos E, Dalmau A, Sabate A, et al. Intraoperative red blood cell transfusion in liver transplantation: influence on patient outcome, prediction of requirements, and measures to reduce them. Liver Transpl. 2003 ;9(12):1320-1327. Benson AB, Burton JR Jr, Austin GL, et al. Differential effects of plasma and red blood cell transfusions on acute lung injury and infection risk following liver transplantation. Liver Transpl. 2011;17(2):149-158. Suzuki H, Bartlett AS, Muiesan P, Jassem W, Rela M, Heaton N. High Model for End-Stage Liver Disease score as a predictor of survival during long-term follow-up after liver transplantation. Transplant Proc. 2012 ;44(2):384-388. Dutkowski P, Oberkofler CE, Béchir M, et al. The Model for End-Stage Liver Disease allocation system for liver transplantation saves lives, but increases morbidity and cost: a prospective outcome analysis. Liver Transpl. 2011 ;17(6):674-684. Li C, Wen T, Yan L, et al. Does Model for End-Stage Liver Disease score predict the short-term outcome of living donor liver transplantation? Transplant Proc. 2010;42(9):3620-3623. Jacob M, Lewsey JD, Sharpin C, Gimson A, Rela M, van der Meulen JH. Systematic review and validation of prognostic models in liver transplantation. Liver Transpl. 2005;11(7):814-825. Ozier Y, Klinck JR. Anesthetic management of hepatic transplantation. Curr Opin Anaesthesiol. 2008;21(3):391-400. Tassoudis V, Vretzakis G, Petsiti A, et al. Impact of intraoperative hypotension on hospital stay in major abdominal surgery. J Anesth. 2011;25(4):492-499. Pierson DJ. Respiratory considerations in the patient with renal failure. Respir Care. 2006;51(4):413-422. Acknowledgements: Chuan Li and Wen Tian-Fu Wen proposed the study. Chuan Li collected and analyzed the data. All authors contributed to the surgery and the relevant discussion. We would like to express our appreciation to the China Liver Transplantation Registry for performing the data collection. This work was supported by a grant from the National Science and Major Technology Project of China (2012ZX10002-016 and 2012ZX10002-017). The authors have no conflicts of interest to declare.